Taught by scholars, military and public service practitioners. 1,100+ alumni occupy strategic service positions throughout the U.S. and overseas. Stopping cyberattacks before they happen is critical. Regent’s online and on-campus Master of Arts in National Security Studies – Cybersecurity Policy equips you with the legal insight, strategies and foresight to help corporations and the nation defend against cyber threats. You’ll focus on cyber defense, social media, communication and infrastructure policymaking to strengthen systems and thwart potential attacks. Broaden your knowledge of grand strategy, national security, U.S. foreign policy and international relations to develop strategic, comprehensive cybersecurity policy. Join our global alumni network of government officials, consultants, policymakers and security professionals in making a difference at home and abroad. Conduct risk assessments, present findings and develop solutions to stop potential threats. Apply a moral and ethical mindset when addressing and influencing policy. 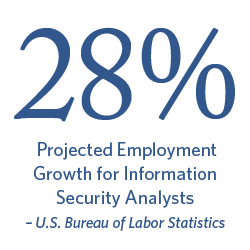 Develop strategic cybersecurity policies to strengthen organizations and the nation. Provides the theoretical and conceptual tools required to understand the grand strategy assumptions underlying Western national security policies since the advent of Clausewitz and Jomini with a focus on the application of grand strategy to military operations across the elements of national power (diplomatic, information, military, economics) and among U.S. and allied forces since World War I.
Unofficial transcripts from a U.S.-based school, indicating successful completion of a bachelor's degree program, can be used for an admissions decision. Email your unofficial transcript to transcripts@regent.edu using the subject line: RSG Master’s Application Pieces. Email your resume to apply@regent.edu using the subject line: RSG Master’s Application Pieces.